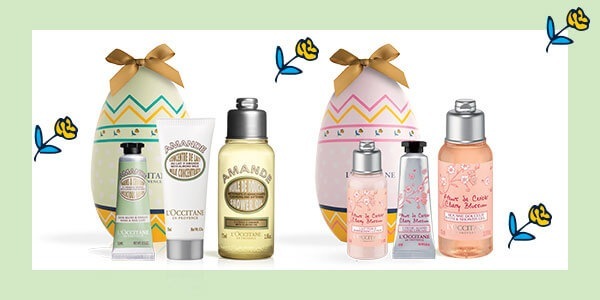 Get your fragrant Easter egg for only €8 (instead of €14) when you spend €20 or more. 2. When your order is €20 or more the Cherry Blossom Easter Egg (Cherry blossom bath & shower gel, 75 ml, Cherry blossom shimmering lotion, 35 ml, Cherry blossom hand cream, 10 ml) and the Almond Easter Egg (Almond shower oil, 75 ml, Almond Milk Concentrate, 20 ml, Almond Delicious Hands, 10 ml) will become available at the special price of €8 instead of €14. 3. Add your chosen Easter Egg to your bag by clicking on it. What will our Easter bunny give you? 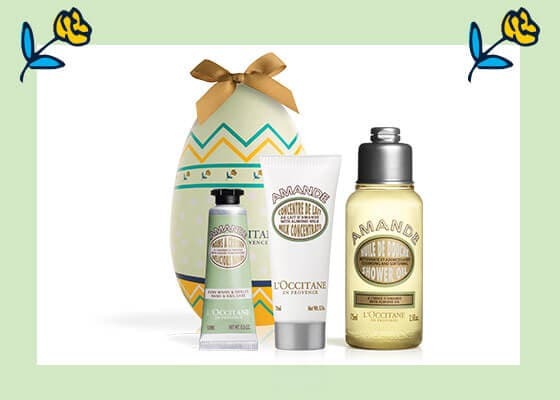 He filled lovely Easter eggs with fragrant Cherry Blossom and Almond products. 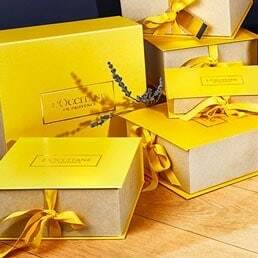 Valid from 15 April to 24 April 2019 in L’OCCITANE boutiques and online at www.loccitane.si. Cannot be combined with any other promotion, gift or discount. Not valid for corporate bodies.